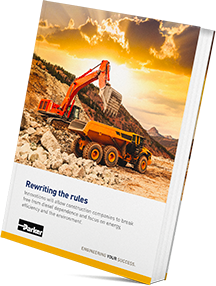 Engineers are always looking to build safer and more efficient machines, whilst reducing exhaust emissions and saving fuel, but what are the solutions currently under consideration? Construction: towards hybrid engines and the recovery of energy to reduce exhaust and noise emissions. Mining: towards fully electrified and automated machines to ensure workers safety whilst cutting down costs and emissions. Forestry: building lighter machines to reduce environmental impact. For more information on all of the solutions under consideration, be sure to download our whitepaper by filling fields in the opposite form. Sign me up for exclusive trainings, trade show invitations, product information and much more by e-mail, post and text. I will be able to unsubscribe at any time.